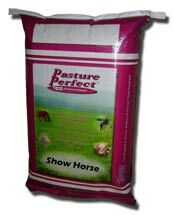 Show Horse Mix provides the horse owner with endophyte-free pastures all season long. Each variety in Show Horse was selected to handle the close grazing habit of horses. Show Horse performs well for making hay or grazing. This mix works well in all areas where cool-season forages can be grown. Show Horse is a "horse-friendly" mix. - Use for a new grass hay field. - Use for renovating an existing pasture. Seeding Rates for a new pasture or hay field should be 35-50 lbs/acre.